This annual trip is always enjoyed by those hearty souls who participate. Way to go! Hundreds of students joined by scores of Binghamton community members came out to bake Challah together in a grand celebration of Jewish culture and lore. This year's Mega Bake was graced with the presence of the renowned "Challah Fairy" who travelled from New Jersey to preside over the evening. Three generations of Binghamton women, Marcia Hoffstein, her daughter Wendy Green and her daughter, Shira, made the blessing over separating the Challah. The evening began with a moment of silence for the young Ezra Schwartz and other victims of recent terror. Teams were formed and the battle for taking home the title was on! There was palpable tension alongside the fun and laughter. Students enjoyed a great night of fun playing a custom designed version of Jeopardy game which began with Havdallah and included Pizza, of course! The annual Chabad Women's Talent Show featured gifted women who sang, danced, read poetry, played music and displayed their art. It was a special evening of bonding and sharing and great desserts! Binghamton is still talking about the scores of cars bedecked with giant Menorahs that rode caravan style through the streets of downtown Binghamton and Vestal, and through the BU campus on Sunday, the first night of Chanukah. The parade culminated on campus with a grand outdoor Chanukah Menorah lighting and party on the spine. It was a night of joy and pride, great light and lots and lots of fun. UNFORGETTABLE! Aside from the huge Chanukah Celebrations Chabad hosted community parties in each dorm bringing refreshments, holiday cheer and warm comradeship throughout Chanukah. For the third year, President Stenger hosted a Chanukah Party for the Jewish community at Binghamton. Warm words, delicious treats, and a performance by Kaskeset made for a delightful time enjoyed by all. Defying all odds and beating the organizer's totally outrageous goal, this year's Toy Drive raised more than $16,000 worth of toys to be distributed to children with cancer in NY area hospitals through Chai Lifeline. The event featured an eye- popping display of the toys, a Menorah Lighting Ceremony, a spirited performance by the Crobys, greetings from a Chai Lifeline administrator and of course, donuts and Starbucks. What a celebration! Students of the Raff Maasim Tovim Foundation visited area nursing homes and brought Chanukah treats and cheer to residents. These students visit nursing homes weekly to spend time with residents. It was a busy festival! Light (lit Menorahs) and Oil (in the form of latkes and doughnuts) abounded and were enjoyed by one and all. Midnight Madness is exactly what it sounds like: students gathering at Chabad at midnight and beyond to enjoy breakfast and bonding with their friends who are all looking to take a break and enjoy a delicious distraction from the "madness" of finals! You can always count on Chabad's Challah baking workshops for plenty of fun and delicious diversion. The new semester began with sweetness as students gathered for a Tu B'shvat Seder enjoying the chocolate fountain, a large selection of fruit and thought provoking ideas to nourish the spirit. It was wall to wall on Saturday night,Feb. 6, with the first Saturday night Live event at Chabad for this semester. Participants enjoyed fresh pizza and fries and music by Main Frame. Zalman Slonim opened up for them on his key board. 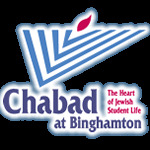 Over fifty student leaders are participating in an ambitious project to unite Jewish students at Binghamton through hosting events which will highlight a meaningful conversation about Jewish identity in 2016. The events will include snacks and activities and are being hosted in honor of the year of Hakhel, the year of Jewish unity. This GNO was an epic winner: a huge crowd of girls enjoyed painting their own canvases with an instructor, sipping mocktails, enjoying snacks and revelling in famale company. "Hadasa nailed it" said Arielle Ingber, a member of the GNO steering committee. Chabad was alive with fun and a spirit of friendly competition as teams vied to win the awesome Torah Scavenger Hunt. A pizza and pasta dinner was enjoyed by all. Chabad was rocking for the weekend of Feb 19-20 with guest Dr. Laz, the Rappin' Rollin' Reggae Rabbi who shared a unique message from his unconventional life. On Saturday night a musical havdallah was followed by delicious pizza and paninis and the screening of "Crown Heights", the showtime movie that stars Howie Mandel as Dr. Laz.